Adding Products | CommentSold Help Center! Products can be a little overwhelming at first, but once you get the hang of it, you will fly through them! I will give you a 0-100 overview of what's required to get a product in CommentSold and ready for sale! First step is to go to Products -> Add Product (click this link to go directly there). You will be greeted with a screen like this. Product Name - this is the name that will be displayed to the users on the site and through Facebook. A good name be "Aztec Ruffled Tunic" - a bad name would be "Product 1" or "Dress"
Brand/Brand Style # - Both of these fields are private and will never be seen by your users. We use these fields to let you run reports to see how well different brands/vendors are selling to your audience, and what the return rates are of those vendors. You may want to look monthly and see that a particular vendor has a 3x return rate as your other vendors, because their sizing isn't consistent or the quality is bad. Size/Colors - Enter in the different variations of the product that you have. If you have a Aztec Ruffled Tunic but it comes in one color and multiple sizes, you'd put Small, Medium, Large in the size box and leave colors blank. Note: Hit enter after each size. If you have a maxi dress that comes in different sizes and colors, you would put S/M, M/L in the sizes and Red, Blue, Black in the colors. Please note, you want the sizes/colors to be easy for the user to type so they can order it through comment selling. Cost/Retail Price - For most shop owners, this is a scary area. CommentSold was specifically built to help you grow - including being your Financial buddy! Put the cost of your item (what you paid for it, per item), and the retail price - what you plan to sell it to your customers for. As a general rule of thumb, you'd like your retail price to be at least 2x what your cost is. Description - This is the product description that your users will see when they pull up the product on the website, phone app or Facebook. An example of a good description may be. Don't overthink it, it doesn't have to be fancy! What's a good product without some images to show your user? 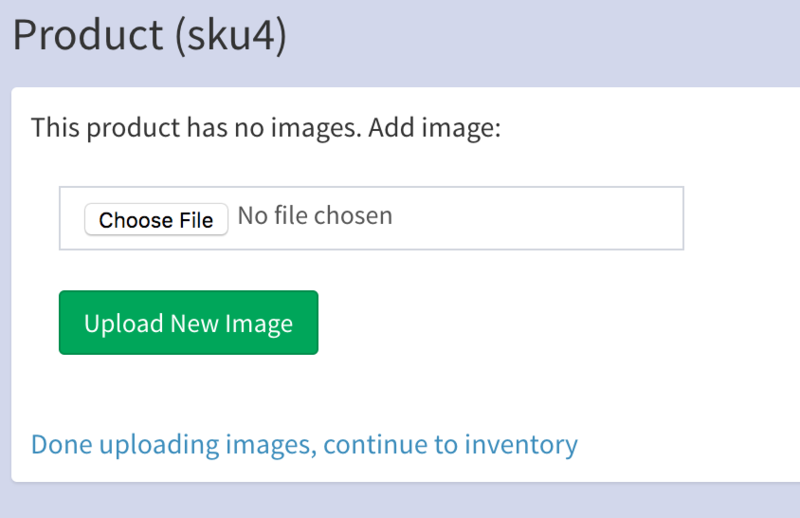 We recommend uploading at lease once image of your product. Click "Chose File", pick one, then select "Upload new image". After uploading, click "Done uploading images". Note, you will want to upload square images (same width/height) for best viewing in Facebook. Inventory management is one of the most important pieces to running a business. If you keep good inventory (which CommentSold does for you), you will have accurate reports of what your clothes are worth, how much money you received from customers and how much money you MADE! but I promise that it'll all click! Please note that you cannot remove or add new types of inventory for this sku. If you realize that you actually have Large, 1XL, 2XL instead of Small, Medium, Large - you need to start over. We do this on purpose to protect YOU! 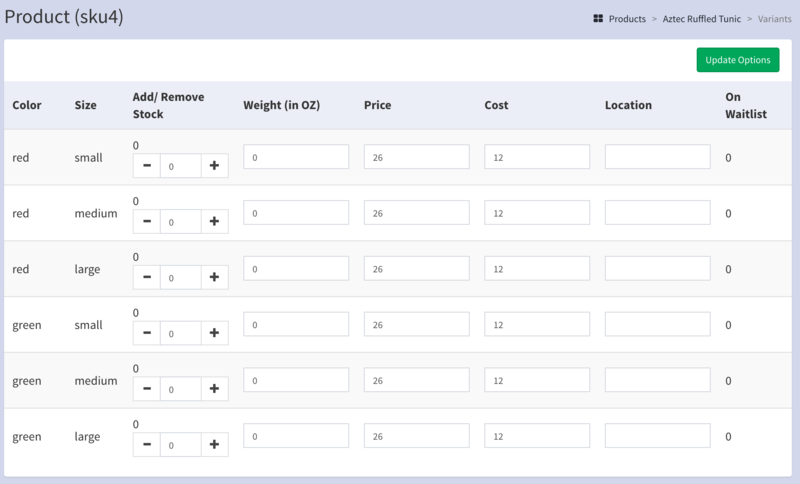 What if you accidentally deleted inventory that many orders were tied to? That would not be good! The first thing you should do is put the weight of the items in. For something like small/medium/large or different colors, where you are confident the weight will be the same, you just have to weight one of the sizes. We usually recommend to error on the side of caution - weigh the large and put that number in there. Your final page will look something like this - see that we have 9 ounces as the weight, and Bin-1 as the location for red, and Bin-2 as the location for green. 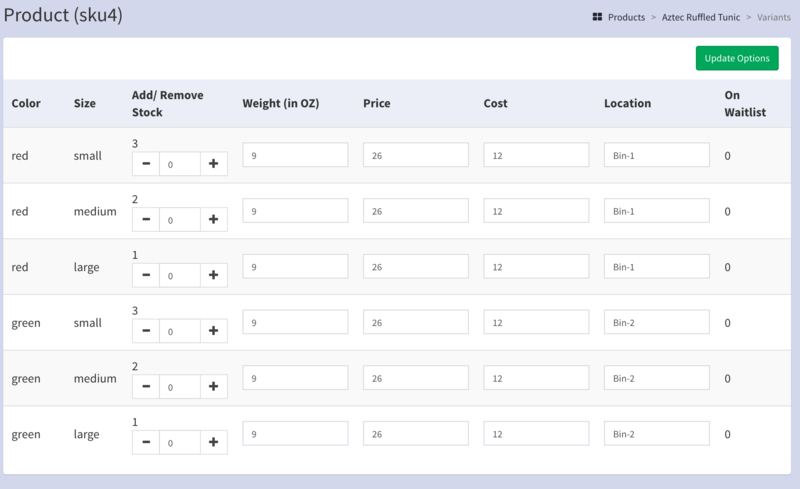 Now if you go back to your Products Page you'll see your new item ready to be posted and purchased! Click here to go the next step - posting it to Facebook! 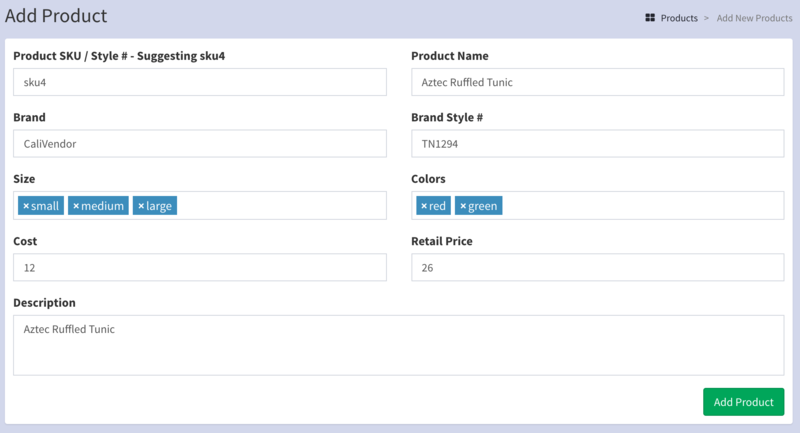 After you enable that, you will be able to print SKU labels to put on your products directly from the inventory page! Click here to head over to a fulfillment overview for more information on utilizing barcodes in fulfillment to eliminate shipping errors!